The “State of the News Media 2013” report from the Pew Research Center’s Project for Excellence in Journalism spotlights the dynamics of a kind of vicious cycle now taking place because of deep business problems in the news industry. As news outlets have slashed staff and reduced the quantity and quality of coverage, the report suggests, many consumers have responded negatively: “Nearly one-third — 31% — of people say they have deserted a particular news outlet because it no longer provides the news and information they had grown accustomed to, according to [a] survey of more than 2,000 U.S. adults in early 2013.” About half of all people surveyed said news stories are not as thorough as they were previously. Of the consumers who reported abandoning certain news outlets, 61% said the decision was based on issues of quality, while 24% said there were not enough stories. For those concerned about the impact of these trends on American democracy, Pew offers more troubling evidence as revealed through coverage of the 2012 election, when reporters played a diminished role in the information ecosystem and increasingly seemed to be acting as “megaphones” for the campaigns, rather than interpreters of claims. Still, as Slate‘s Matthew Yglesias points out, news consumers have, in theory, greater options for acquiring information in the digital age than they may have ever had. But questions remain about the increasing political polarization of many outlets, as well as the effects of a more fragmented news media that can seldom convene broad public discussion around common sets of facts. Indeed, another interpretation of the Pew report’s main finding, from UCLA sociologist Gabriel Rossman, is that ideological opposition to the traditional media — particularly among conservatives and males — is actually a chief driver of the recent trends, and the perceived decline in quality is not the primary reason for large numbers of people abandoning news outlets. Although overall magazine subscriptions were relatively stable, “all of the major news magazines saw declining audiences in 2012. According to the Alliance for Audited Media, sales of newsstand copies, the measure most accepted by the industry, plummeted 16% on average for the news magazines, roughly two times the 8.2% decline in newsstand sales that the magazine industry suffered over all.” Across a sample of six magazines, levels of print advertising revenue fell 10%. The overall audience for local television news saw a “steep decline,” dropping 6.5% over the period 2011-2012. This comes despite putting more segments on the air, particularly in the morning time slots. However, because of the huge amount of election-related advertising, revenues actually grew in 2012. Further, the “median full-time TV news staff hit an all-time record of 32 employees in 2011, an increase of more than 4% from the year before,” and many local television stations said they planned to increase hiring. For further insights into the future of business models in journalism, see the analysis of Ken Doctor at Nieman Journalism Lab and Felix Salmon at Reuters. 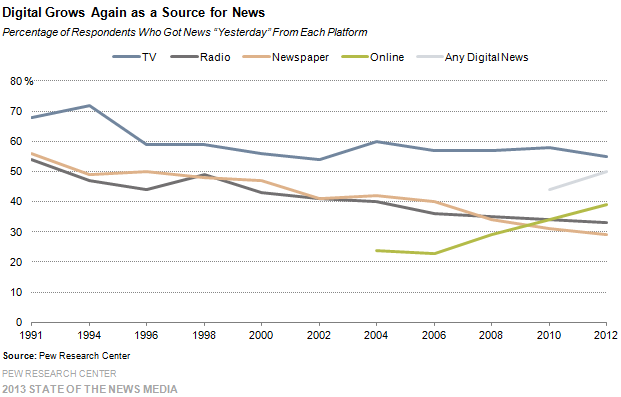 Citation: "The State of the News Media 2013," Pew Research Center, Project for Excellence in Journalism, March 2013.